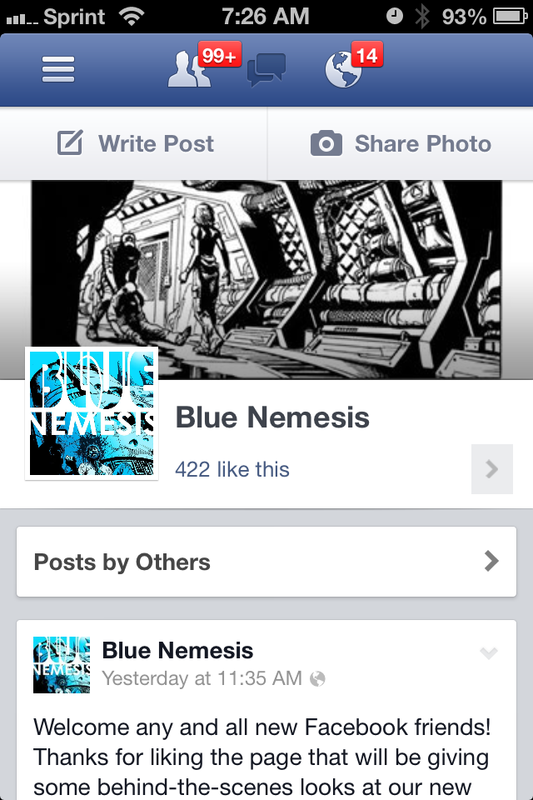 Blue Nemesis Facebook Page Explodes! This past Tuesday, artist Stephen B. Scott and I decided to unleash the BLUE NEMESIS Facebook page we had been compiling to fans of comics and science fiction. Ultimately, we were looking forward to getting the initial word out on our new project, so when I invited my FB contacts and stepped away from the computer, I figured we would get a few interested folks to stop in and look. What I didn’t expect was to check my phone a hours later to check the page’s progress and be greeted by the image above. From the time the page was unveiled to the closing hours of Tuesday, the outpour from fans hoping to see more of this book was pretty damn humbling. Now that the initial push has subdued, we’re still getting in a steady trickle of likes, and we hope to get even more people interested in the book as we start posting more progress and news for the title. In the meantime, see what all the fuss is about at www.facebook.com/bncomic.